Voice and SMS revenues have been eroded by the increasing use of IP-based services such as instant messaging and voice over IP (VoIP). 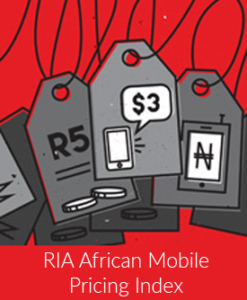 African operators have reacted to this change in the telecommunications market by providing bundling voice, SMS and data services. In South Africa, only MTN and Cell C have introduced prepaid bundled services. Such bundles however are not cheap. With the new mobile termination rate glide path only effective from the end of March 2014, and the implementation delayed by a legal challenge from operators, the effects of the enforcement of the new termination rates are not evident in the market yet. Even so, with increasingly small margins from voice mobile operators have already turned their focus towards data where pricing appears more competitive and is based on bundles. Download the RIA policy brief No 2 April 2014.